Widely thought of as Scotland's Nelson, Sir Andrew Wood was unquestionably the first of a pantheon of naval heroes who would ensure that Britannia ruled the waves for nearly three hundred years. As Admiral to the Scottish monarchs James III and James IV, it was his infectious courage, his powers of leadership and diplomacy, and those scores of embarrassing successes against marauding privateers and the best fleets England could throw at him that finally induced the Tudor King Henry VII to launch a standing navy that would, in time, establish Great Britain as a world power. This book is a biographical account of the life of Sir Andrew Wood (circa 1450-1515), the seagoing merchant of Leith by Edinburgh, who prospered as he fought off buccaneers and the fleets of foreign governments till his reputation for mastery of the seas brought him the feudal barony of Largo in Fife and the rank of Admiral of Scotland. He served kings James III, IV and V, whose turbulent and uncertain times are the setting of this true tale of conspicuous valour, bloody political intrigue and familial love. All this amounts to a thoroughly fascinating and thrilling tale that you can read on your PC, laptop, tablet, iPad or smartphone. Douglas Speirs, the distinguished head of archaeology at the University of St Andrews, has written: "Sir Andrew Wood is a figure of immense magnitude who deserves to be as well-known as *William Wallace or Robert the Bruce, but he has been overlooked. The problem is the lack of surviving records from the period [huge amounts went missing; presumed destroyed], compounded by the consequent educational misconception that nothing much happened in Scotland between the Wars of Independence and the Reformation. As a result, we probably know more about the Battle of Hastings and the Norman Conquest than we do about this turbulent period in late mediaeval Scottish history." However, since Dr. Speirs wrote those words, important previously unknown primary sources of evidence have come to light that illuminate every chapter of 'Scotland's Admiral'. Choices. You will receive this e-book shortly as a pdf email attachment that you can store on your hard drive or save in a disc or memory stick/card. You can also print yourself a paper copy (about 350 pages) or read it from your screen. 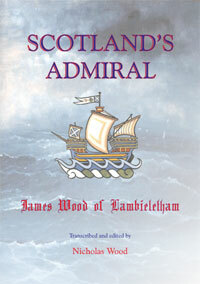 Scotland's Admiral is also available in Kindle format.